#KarunaikizhanguChutney : #Karunaikizhangu chutney is not grinding type of chutney. It is prepared just like the way sambar is being prepared but without lentil. 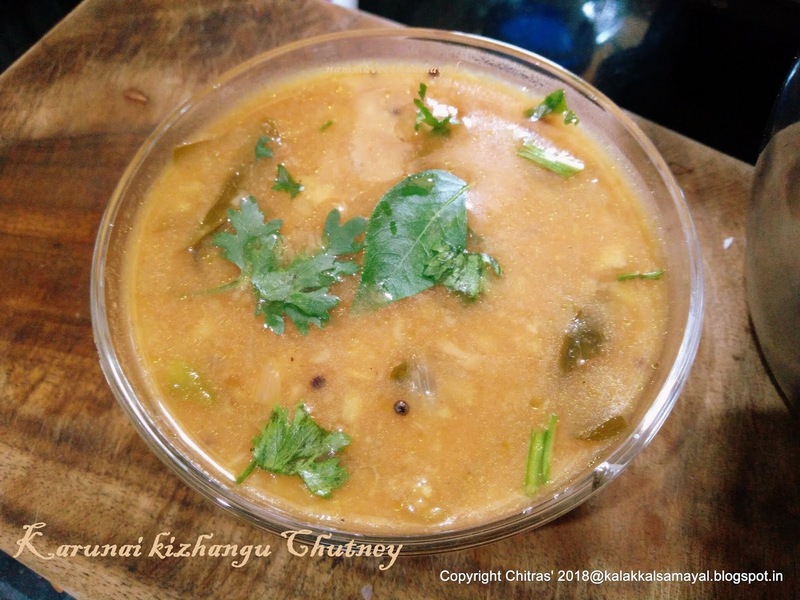 We have already seen the preparation of Katharikkai [ brinjal ] chutney and Peerkangai [ ridge gourd ] chutney. 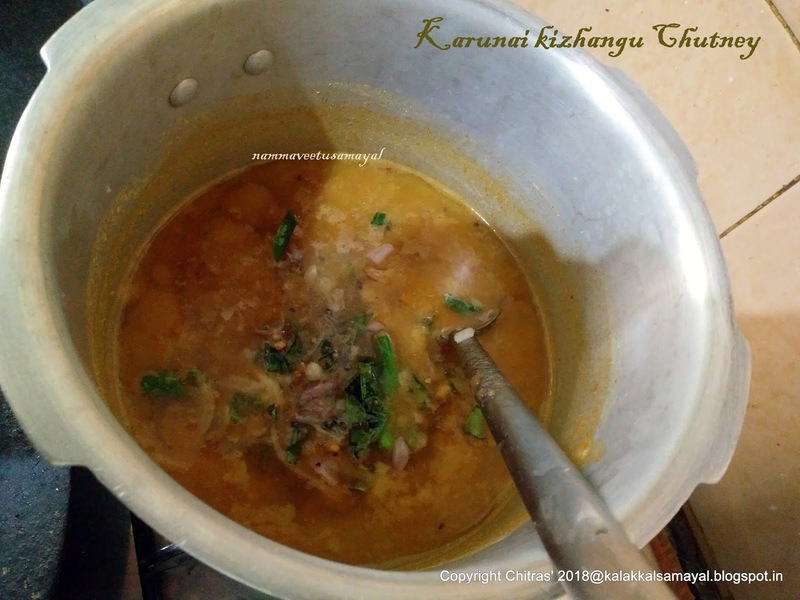 Karunaikizhangu has to be cleaned well with water and cooked in pressure cooker. Then the skin is peeled off and mashed with potato masher. Saute chopped onion, curry leaves and green chilly. Take mashed karunaikizhangu, sauteed onion, Sambar Powder, tamarind pulp, salt in a pressure cooker. Cook on high flame for 2 whistles. 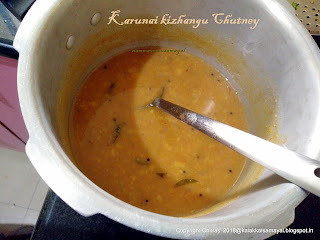 Now tasty and spicy karunaikizhangu chutney is ready to serve. 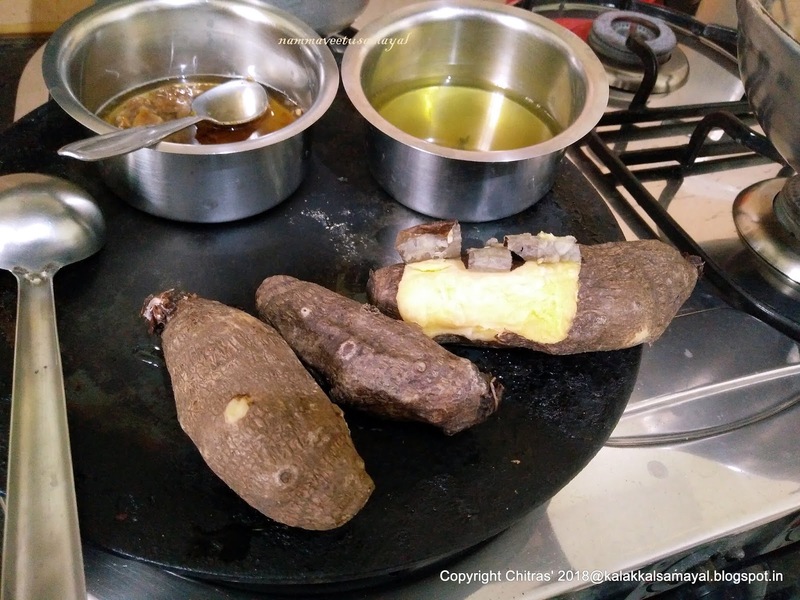 Now we will see the ingredients and detailed method of preparation. A small amount of chopped coriander leaves to garnish. 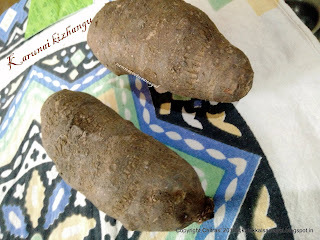 Soak tamarind in hot water. 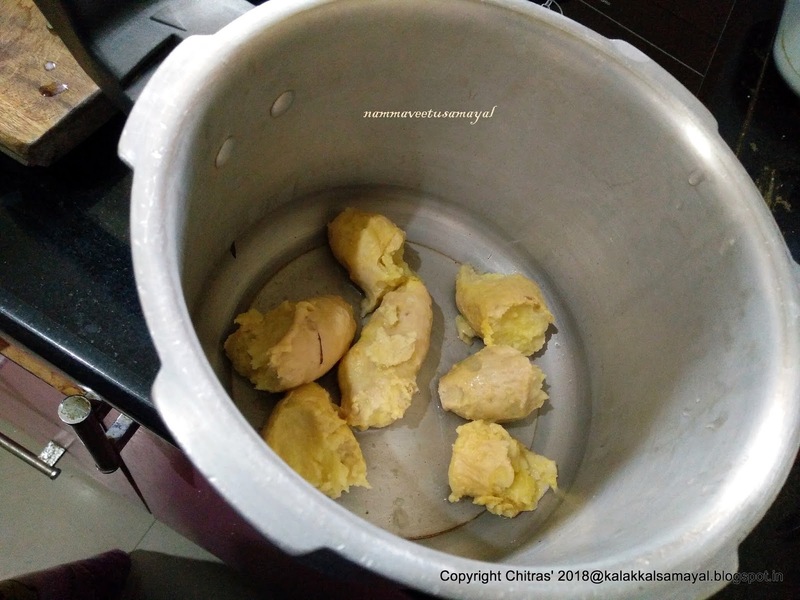 Wash #Karunaikizhangu and put in a pressure cooker. Add 3/4 cup of water and 1/4 Tsp of salt. Pressure cook for a whistle and then reduce the flame and cook for 7 minutes. The kizhangu has to be cooked well, otherwise it will give itching sensation in your tongue and throat. Now peel off the skin and take in a pressure cooker. Mash nicely with potato masher. 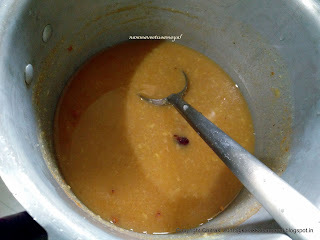 Then add 3/4 cup of water, salt, turmeric powder, Sambar Powder, Araithuvitta Kuzhambu Powder. 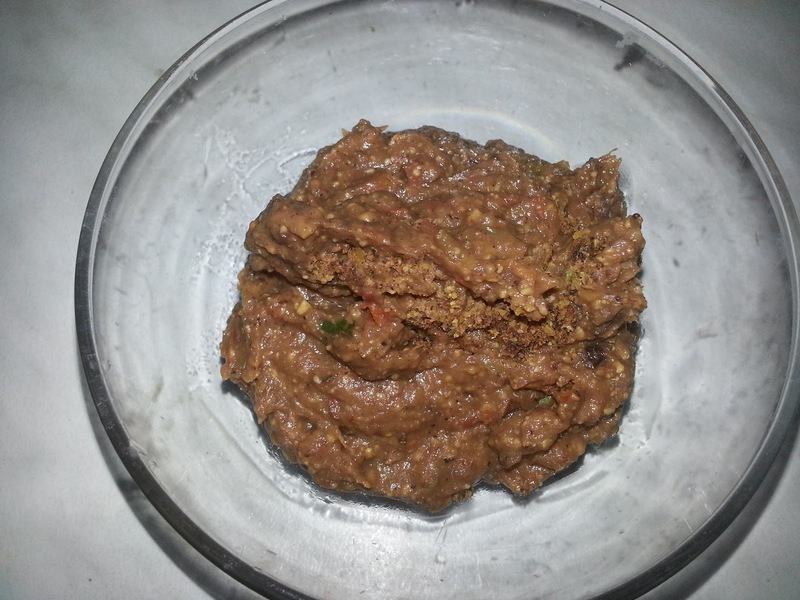 Squeeze pulp out of soaked tamarind with 1/3 cup of water and strain through a colander into the pressure cooker. Mix thoroughly with a ladle. 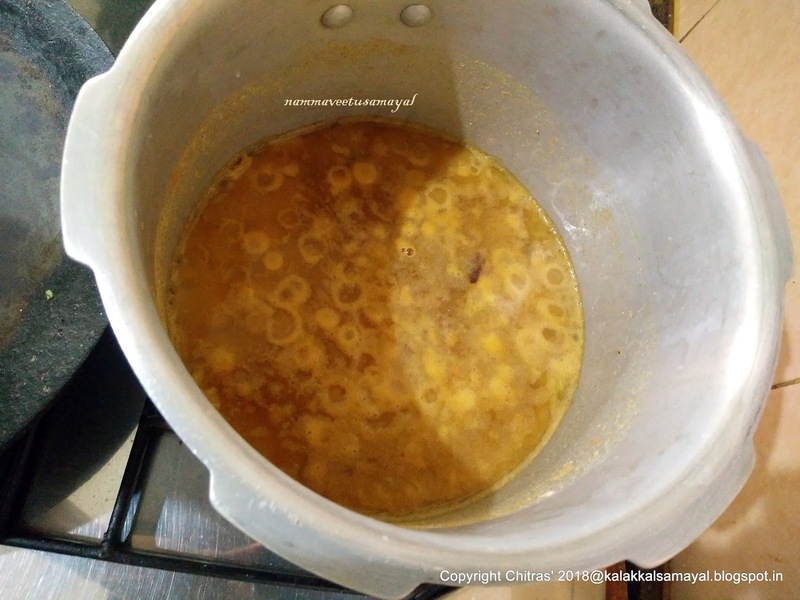 Heat a kadai on medium flame with oil. Crackle mustard seeds and then add asafoetida powder, curry leaves, green chilly and chopped onion. Saute well till onion turns translucent. Transfer into the pressure cooker. Mix well and pressure cook for 2 whistles. Turn off the stove and allow to rest till steam subsides. Transfer into a serving bowl and garnish with curry leaves and coriander leaves. 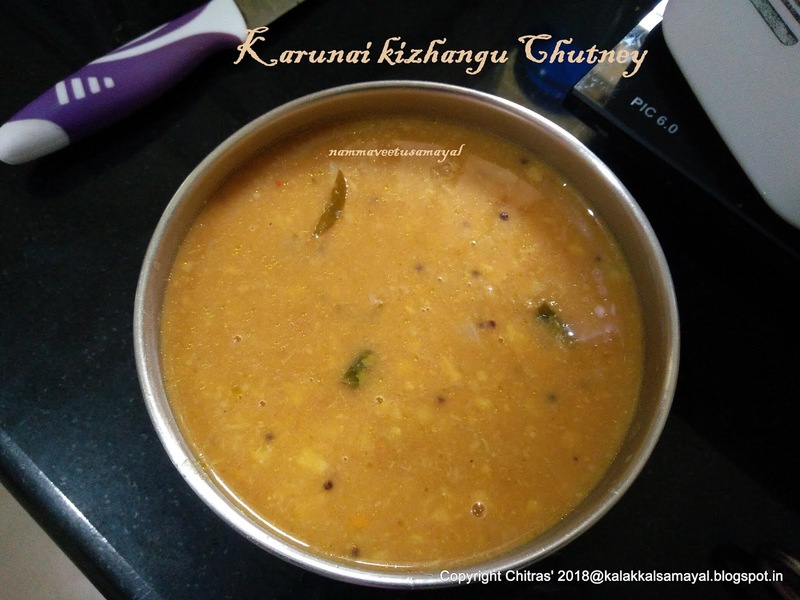 Take hot white rice in a plate and pour a ladle full of karunaikizhangu chutney and mix well and enjoy with any poriyal of your choice.